Ask yourself this: Do you know the name of any one of the victims killed in the West Chemical and Fertilizer Company disaster? Do you know how many of them there were? Their ages, aspirations, what they looked like, whether they left behind children or what messages they last posted on Facebook? Do you know if there is an explanation yet for what caused the explosion? Or if investigators are still searching for one? You probably don’t know the answer to any of these questions, and I didn’t either until I started writing this article. I didn’t know that as of Sunday, April 21, four days after the explosion, officials have confirmed fourteen deaths, eleven of whom were first responders, and that as many as sixty people remain missing. I didn’t know the name Jerry Chapman, 25, who volunteered with the Abbot Fire Company and who, according to his girlfriend Gina Rodriguez, was training to be an EMT. I didn’t know the name Cody Dragoo, 50, who was both an employee of the fertilizer plant and a West firefighter (the town has an all-volunteer force). And I had never heard of West firefighter Morris Bridges, 41, who lived just a few doors down from the facility and whose 18-year-old son Brent Bridges stood on the porch as the blast that killed his father blew out the windows of their home. I do know, however, the names and faces of Sean Collier, Krystle Campbell, Martin Richard and Lu Lingzhi. I know that Sean, 26, had been on the MIT police force for a little more than a year when he was allegedly shot by Tamerlan and Dzhokhar Tsarnaev, that Lu was a Chinese national studying at Boston University, that Krystle was a regular Boston Marathon watcher and that Martin was just 8 years old and had recently made a sign that read No More Hurting People Peace. I’ve seen the photo of him holding, with obvious pride and joy, those words drawn on a sheet of blue construction paper more than a dozen times. I can’t get away from it on Facebook, and when it shows up on my feed, I can’t look away. What separates these victims from one another? Surely not innocence, for they are all innocent, and they all deserve to be mourned. And yet the blunt and awful truth is that, as a nation, we pay orders of magnitude more attention to the victims of terrorism than we do to the over 4,500 Americans killed each year while on the job. As former Secretary of Labor Hilda Solis once put it, “Every day in America, thirteen people go to work and never come home.” Very little is ever said in public about the vast majority of these violent and unnecessary deaths. And even when a spectacular tragedy manages to capture our collective attention—as the West explosion briefly did, as the Upper Big Branch Mine disaster did three years before—it is inconceivable that such an event would be constituted as a permanent emergency of world-historic proportions. Let’s imagine that they were, as many have rushed to suggest that the Boston Marathon bombing ought to be. Let’s imagine that instead of sending a handful of investigators from the ATF and the Chemical Safety Board to West, Texas, we marshaled every local, state and federal resource available to discover the exact sequence of events that led to the explosion. Let’s imagine that the question—Why?—became so urgent that the nation simply could not rest until it had overdetermined the answers. We’d discover that OSHA hadn’t inspected the plant in twenty-eight years—did this play a role in the disaster? If it’s found that the company that owns the plant, Adair Grain, violated safety regulations, as it had last year at another facility, we might call it criminal negligence and attribute culpability. But would we ascribe ideology? And which ideology would we indict? Deregulation? Austerity? Capitalism? 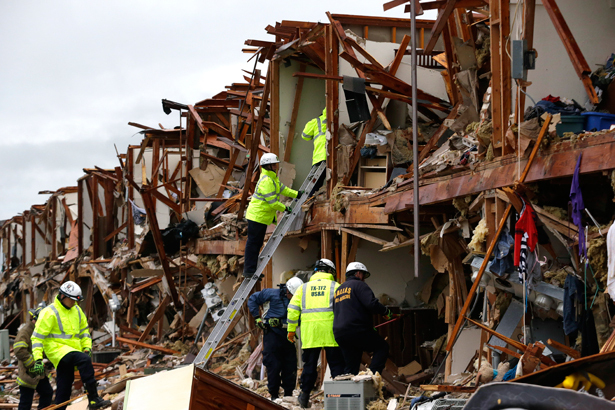 Would we write headlines that say Officials Seek Motive in Texas Fertilizer Explosion? And could we name “profit” as that motive in the same way that we might name, say, “Islam” as the motive for terrorism? Would we arrest the plant’s owners, deny them their Miranda rights and seek to try them in an extra-legal tribunal outside the Constitution, as Senator Lindsey Graham has suggested we treat US citizen Dzhokhar Tsarnaev? Would we call for a ban on the production of ammonium nitrate and anhydrous ammonia? Would we say that “gaps and loopholes” in our nation’s agricultural policies were responsible for the tragedy, as Senator Chuck Grassley has suggested about immigration in the Boston bombing case? No, we won’t. We won’t do any of these things, because even if the West fertilizer plant disaster is ultimately understood as something more than “just an accident,” it will still be taken as the presumed cost of living in a modern, industrialized economy. When it comes to terrorism, we have the opposite response. We launch wars against other countries, denude the Constitution and create massive state bureaucracies for espionage, covert operations and assassinations. Since 9/11, it’s become a political imperative that our nation must express zero tolerance for terrorism, even though, like workplace fatalities, terrorism has been with us long before globalization lent it a more exotic and threating provenance. To the problem of violence, there ought to be a path between callous indifference and total social warfare. And that’s why the miserable and absolute failure of gun control legislation in the Senate—just two days after the Boston bombing and on the same day of the West explosion—was especially galling. Like acts of terrorism, the murderous rampage at Sandy Hook Elementary School precipitated a national crisis. In the wake of that tragedy, our collective grief took a particular shape, the shape of democracy. The deaths of those school children were linked to the fate of more than 30,000 victims of gun violence each year, and the impulse to act was channeled through our democratic system, where an overwhelming majority of Americans and a majority of the US Senate expressed support for new gun laws, which were nonetheless defeated. Last night, a Fox news anchor cited a poll that claimed that just 4 percent of Americans think gun control is the “the most important problem facing the country today.” Implicit in his commentary is the idea that because gun violence isn’t seen as the singularly most urgent issue, it isn’t an issue at all, that like workplace fatalities are to a modern economy, so gun violence is to the Second Amendment—just a cost we should get used to. The ethnically Chechen Boston Marathon suspects confuse many of the assumptions the media likes to make when covering such attacks, Leslie Savan writes.